The ultimate guide to Kuhtai ski holidays in 2019 & 2020. “Forget stress and just enjoy!” is the motto here in Kühtai, and that’s exactly what this place is good for. Take advantage of glorious scenery and top-quality, snow-sure skiing, in this small, tranquil village that will feel like your very own little bit of the Austrian Alps. 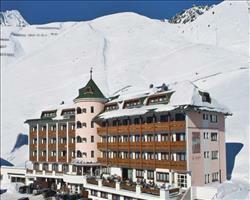 Nestled comfortably between some of the soaring peaks of the Austrian Alps, you’ll find the quaint ski resort of Kühtai. The village is brimming with character and Tyrolean charm, and at 2020m is one of Austria’s highest winter sports resorts. This means it is very snow-sure, and can usually offer fantastic skiing late into April. The resort is a mere 35km from Innsbruck, and a 45 minute drive from the airport, meaning it is remarkably easy to get to and from here, and should you be able to take a day off the great skiing then it makes the perfect opportunity for a day trip to admire Innsbruck’s baroque architecture and soak up the rich history. Despite its great location and top-quality skiing, the resort remains quiet and uncrowded, so you’ll be able to take full advantage of the modern lift system here without having to deal with the queues. What’s more, many of the hotels and chalets here are ski-in ski-out, so every morning you can get snug in your heated ski boots and head on up to the freshly-fallen powder which has helped earn Kühtai the Tyrolean Stamp of Quality for Ski Runs. Owing to Kühtai’s quiet, peaceful atmosphere, the resort often attracts families and people who prioritise skiing over après ski parties. The village itself is small, compact and very centralised, paving the way for all the doorstep skiing opportunities. Ski passes encompass both Kühtai and the neighbouring Hochoetz (AKA Ochsengarten), which is reachable on the free half-hourly bus running between the two resorts, and as an added bonus, little ones receive a free ‘Kids-Küh-Card’ which can help save you a small fortune . If this still isn’t enough for you, then the Super Skipass entitles you to skiing in an additional 3 resorts: Niederthai, Gries, and Sölden. View our detailed Kuhtai snow forecast or snow report and see all live webcams, piste maps, road and travel maps and lift pass prices. For a picture of historic snow conditions see the snow depths month by month with our Kuhtai snow history. 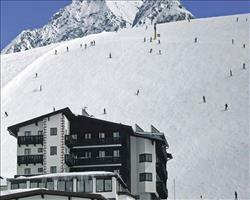 As can be expected from a resort with an altitude over 2000m, there is some great skiing available here. Beginners can learn the basics from ski schools, such as Skischule Kühtai or Follow Me (both with equally adorable mascots Wufi and Kühti, respectively) as well as Top 2000 ski school. Whilst opportunities are great for learning here in Kühtai, it should however be said that there isn’t too much in the way of wide gentle blues for novices to build up some confidence. The Sonnenlift and Wunder-Teppich pistes are good for getting to grips with the snowplough, but the highest altitude blue, under the Schwarzmooslift, precedes a red return back down to the resort which may be too challenging for some. This is an intermediate’s paradise with a ton of great reds dotted converging in the centre of the resort. Highlights include the North-facing pistes (numbered #11-13, 15) underneath the Alpenrosenlift and the Hohemutbahn lifts, as well as the #16 return from the Kaiserbahn gondola. Experts will enjoy piste #14 as well as the blacks underneath the Gaiskogellift; however for a more of a challenge the Kaiserbahn ski route or anything else off-piste when there’s sufficient powder are better options. The reds and blacks here all tend to be fairly steep and often follow the fall line down the pistes, meaning you’ll be in for a bit of a challenge, but without big turns disrupting your rhythm. Snowboarders will find a rather large slice of heaven in the form of the ‘K-Park’ in between Alpenrosenlift and Hohemutbahn. This Snowpark was used for the 1st ever Winter Youth Olympics; if it’s good enough for them, it’s more than enough for us, and the 6m high Superpipe and cross course (to name but a couple) certainly don’t disappoint. Kühtai is a relatively quiet and tranquil village when it comes to après ski atmosphere, but this is a small price to pay when you have no queues for the ski-lifts and acres of space on the slopes. However this takes nothing from the quality of the food and drink on offer in the cosy restaurants and pubs, perfect for a hearty meal with the family or a few bevvies with some friends. The Kühtaier Dorfstadl is great for some local cuisine, and equally good for a shameless cheesy disco night on Saturdays. If a quick lunchtime snack is all you need to fuel the rest of your day on the slopes (and you want to save some room for afternoon cakes at your chalet!) then the cheekily named McKühtai will keep your hunger pangs at bay. In terms of activities besides skiing, Kühtai has loads of stuff on offer. If you’re a non-skier, or if you can (somehow) be tempted away from the slopes, you’ll be greeted with a range of activities, including snow shoe hiking into enchanting snow-covered forests and mountains. If you can put up with the beautiful game being called being called anything other than ‘football’, then swap your Sunday morning league for some of Iglu Village’s ‘Snow Soccer’ and let your inner Ronaldo run riot on their floodlit 5-a-side snow pitch. Also in Iglu Village’s catalogue of activities is ‘Zipfelbobing’. I know what you’re thinking, and yes, Zipfelbobing is as much fun to do as it is to say. A Zipfelbob is essentially a faster Tyrolean version of a bum board, and you’ll have the choice of zooming down the slope on one of them, inflatable snow tube, or snow bike. When is the best time to ski Kuhtai? Kühtai has a lofty altitude of 2020m, meaning it is known for having fantastic conditions throughout the season, although for the absolute best conditions we’d recommend getting your skiing here done before mid-March. In addition, the resort is home to a decent amount of snow cannons as well as some good piste-maintaining equipment to ensure the slopes and Snowpark are in perfect condition. The village rarely falls victim to large crowds, so whenever in the season you decide to come and take advantage of the great skiing on offer here, you won’t need to worry about being caught up in the peak season ski lift queues. Kühtai is a fantastic resort if you’re looking for a quiet relaxed ski break with the family, as well as a great place to bring little ones eager to learn how to ski. The experienced ski schools, like Top 2000 and Follow Me, will teach your tots the basics on the nursery slope as well as keeping them well entertained. This leaves you free to go and make the most of the resort’s fresh powder and exhilarating runs (we like the reds under the Dreiseenbahn lift!). If anyone in your family doesn’t ski and you already have your heart set on Kühtai, then don’t worry and get booking, as the off-the-slope activities here will keep the non-skiers just as happy while you’re zooming down the well-groomed pistes. They can choose from a range of activities, like hair-raising tobogganing, sledging with huskies and fascinating avalanche transceiver searches, before meeting in one of the welcoming hotel restaurants for some family time recounting the day’s adventures! The accommodation here is not only spacious, well facilitated and comfortable, but many of them also offer ski-in ski-out access, including the Alpen-Residenz Mooshaus which is just 100m from the nursery slopes and ski school meeting place, saving you a long walk or tiresome wait for the ski bus. If you were after a chalet, the Chalet Hotel Elisabeth has a great location, and the promise of a wonderful stay. Whatever accommodation you’re looking for, book it in a package including transfers and flights for the best value. Alternatively, if you can keep the kids entertained enough on the journey, we offer channel crossing and accommodation packages for self-drive holidays, or just accommodation if you’re travelling completely independently. Kühtai’s range of terrain and diverse choice of non-ski activities make it a perfect place for travelling in a group, with something here for everyone. Expert skiers can head off to the black runs under the Gaiskogellift, whilst people skiing for the first time can get to grips with the snow at one of the knowledgeable ski schools. If the challenging runs or just the ski instructor’s talk of pizza slices and French fries has you feeling a bit peckish, then meet the rest of the group for a quick snack at McKühtai. If anyone fancies a day off the slopes, why not bring out your competitive sides with some Snow Soccer at Iglu Village, or to really separate the men from the boys, a gruelling biathlon challenge. If there are kids in the group, they’ll have a great time experiencing what it’s like to be a ‘musher’ for the day with some adorable huskies. The accommodation here in Kühtai means if you’ve got any stragglers who decide last minute that they want to join the trip, the spacious Alpen-Residenz Mooshaus or Hotel Alpenrose (to name just two) should have enough room to add the latecomer to your booking. Whichever accommodation you choose, you’ll find it as part of a package including flights and transfers, channel crossings for self-drive or simply on its own if you’re sorting out the journey independently. We found Kuhtai very nice. We’ve been skiing in Switzerland and it’s definitely comparable. We weren’t looking for expert skiing, we’re intermediates and would definitely recommend the ski area to other people of the same level. We were here with a group of mixed skiers and snowboarders. There were some new skiers in our group and we took our disabled daughter on a couple of professional lessons and then all went out together, which there were some perfect slopes for. The only thing to note: if you go to a different ski area for the day, make sure you don’t miss the last bus! You might end up waiting 2-3 hours for a taxi which isn’t fun! New Years week is expensive but definitely worth it for a special trip – they had a huge firework display which we could watch from our hotel balcony. "Good late season skiing for intermediates and ambitious beginners"
I was very impressed by the fact that it snowed twice while we were there although it was mid-April! The skiing was good. It was only our 3rd ski holiday and the skiing was about the right level for us. Any harder and it would have been too hard – you have to be able to ski down some red runs to get back down into the village. I’m not sure what the grading was like, we went on one short black and the ski instructor said it was more like a red run. There were definitely some steeper parts towards the bottom of the resort. I think it’s a good resort for intermediates, advanced skiers would probably get a bit bored and if you are very much a novice then it wouldn’t suit you either. We were in the ski school which was good, I would recommend our instructor Martin. He kept telling us he couldn’t speak good English but his English was fine. Our group was small but quite mixed ability and one man ended up dropping out because he was basically a complete beginner and he struggled too much on the red runs. Our instructor did well keeping us all happy even though we were different levels. Our group was only made up of 4 people and it was nicer having a smaller group. We had private tuition on Wednesday too. On Wednesday they also did night skiing on run number 5 (I didn’t do it because it was icy but my husband and son did) and afterwards the instructors put on a little show where they did tricks and generally showed off. The resort is a damp squib in terms of après ski – there is more life in a very quiet village in England! By 6pm everyone is at home. That was fine for us to be honest because by the time we had showered, eaten, etc, it was time for my son to go to bed. There were about 4 or 5 ski ware shops and even my son commented on how expensive the souvenir shop was. The ski pass also covers Hochoetz which is the next village along, you can do a trip here if you like (we didn’t bother). I love skiing. There were some points in time, like when we were sitting at the café on the mountain, I felt like I was on top of the world! Take the chair lift up to the Dreiseen Hütte and tackle either of the two rolling runs that drift off from here – the whole affair is pretty laid back, with a neat mix of altitude and steepness making for a sweet ride. All good things come in threes and Kühtai Mountain does it best; 3 broad reds wiggle their way down to the village, an ideal spot for middling abilities. If it’s all about letting go, then the red which spans the distance of the Hochalterbahn takes top spot; it’s not hard to clock up some outstanding speeds as you whip down the mountain. I hadn’t snowboarded in Kuhtai before, I’d say it’s a more intermediate resort as it has lots of reds and it’s not ideal for snowboarders as there are quite a few flat patches. There are some nursery slopes if you’re a beginner, but once your confidence is up you want to explore around which is a bit tricky when its mostly red. It depends what type of skier or snowboarder you are, if you don’t mind staying on a few runs you feel comfortable on, it would be fine but we would have liked more variety of runs. Kuhtai is quite a quiet resort which suited us, there’s not much going on in terms of après ski but this is the kind of place we like.